Though it remains unfinished, the Silver Spring Transit Center has been in planning since 1997. 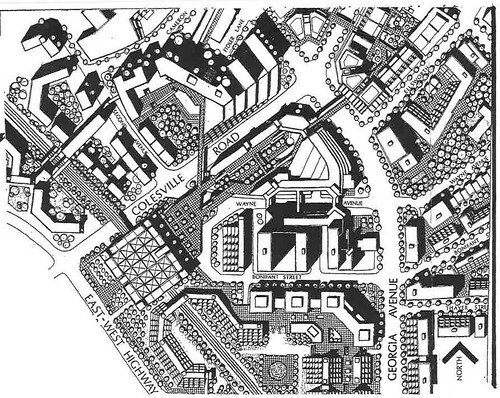 But 20 years before that, architecture students created this proposal for a giant box stretching across downtown Silver Spring. 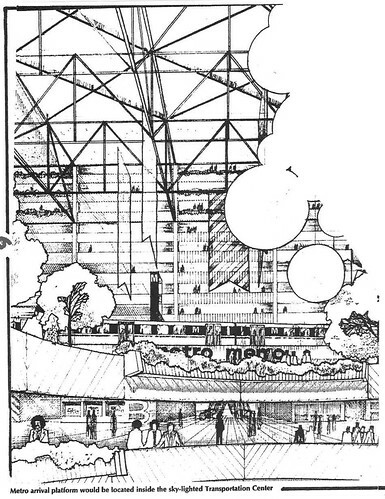 A 1970s proposal for the Silver Spring Transit Center. All images courtesy of Neil Greene. Silver Spring is one of the region's largest transportation hubs, bringing together Metro, commuter rail, local buses, intercity buses, and eventually the Purple Line and the Capital Crescent Trail. Fitting all of those pieces presents a pretty interesting design challenge, and naturally attracts architecture students. When I was in architecture school at the University of Maryland, I saw more than a few thesis projects reimagining the transit center. A section drawing of the proposed transit center, which would have also contained stores, offices, a hotel, and apartments. 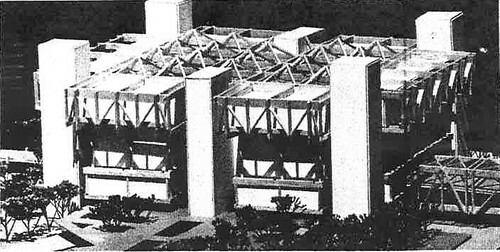 Recently, Action Committee for Transit's Neil Greene found this proposal for the Silver Spring Transit Center produced by a group of architecture students at Catholic University in the 1970s, right before the Metro station opened in 1978. Like the most recent plans for the transit center, which have since fallen through, they surrounded the transit center with buildings containing apartments, offices, a hotel, and shops. Except in this proposal, they'd all be in one giant superstructure surrounding the station platform. In their design, Metro trains would pull into a giant, skylit atrium, surrounded by shops and restaurants, with apartments, offices, and hotel rooms above. 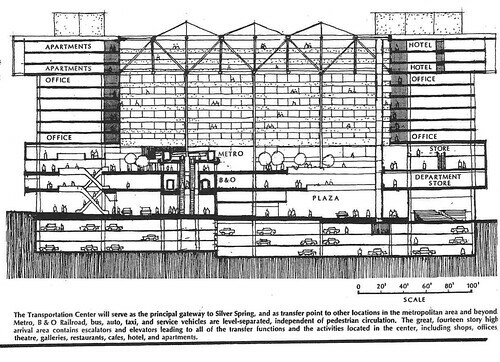 That was a really popular idea at the time, pioneered by architect John Portman, though I don't know of any atria that included a train station. Metro trains would have passed through a giant atrium. Directly below the platform was the B&O Railroad, the precursor to today's MARC commuter rail. Below that were buses, taxis, and a kiss-and-ride, as well as an underground parking garage for commuters. The entire structure would have stretched over multiple blocks from Colesville Road and East-West Highway, where the NOAA buildings are today, up to Wayne Avenue, where the current transit center is. Existing streets would go through the transit center in underpasses, while skybridges would allow visitors to travel through the rest of downtown Silver Spring without touching the street. Skybridges would have connected the transit center to the rest of downtown Silver Spring. Of course, this was just a student proposal, and was never carried out. But Montgomery County did propose skybridges in downtown Silver Spring as early as 1969 and, by the 1970s, had drawn out an entire network of them, most of which were never built. This was in keeping with the prevailing wisdom of the time, that cars and pedestrians should be kept separate. But as we've seen in places where this actually happened, like Rosslyn or Crystal City, this doesn't work very well, and those communities are getting rid of their skybridges. Of course, had we actually pursued a design like this, the Silver Spring Transit Center might have actually opened by now. Repair work on the current facility is currently underway and Montgomery County officials say that it could open next year, just seven years after groundbreaking.